IT Cosmetics Launches in the UK! Home » IT Cosmetics Launches in the UK! The thing that first struck me about IT cosmetics is the high pigments and good coverage in general of all of the products. I first want to touch on the Vitality Cheek Flush which is a hydrating and brightening anti-ageing powder blush stain. I love make-up that not only does its job but also has a skincare element to it whether that is anti-redness, anti-ageing or brightening. The cheek flush powders are really high pigment so you only need a dab. Because you only need to use a tiny bit one cheek flush powder is going to last you ages and ages. The powders also contain plum oil, cherry oil, pomegranate, grapeseed and jojoba as well as vitamins A, C and E, hyaluronic acid, green and white tea and aloe. Now tell me have you ever tried a blusher with that many amazing skincare ingredients? I don’t think so! All of the IT Cosmetic range is developed with world-renowned plastic surgeons and dermatologists so you know that what you are getting is goooooood. The products are also 100% cruelty-free, high-performance and good for sensitive skin too. Next up is the lipstick or to be more exact, the Vitality Lip Flush. These are a 4-in-1 reviver for lips with plum oil, cherry oil, shea butter, argan oil and jojoba plus vitamins A,C and E as well as green and white tea and aloe. I’ve got the lipsticks in (from left to right) in Love Story, Je Ne Sais Qui and Pretty Woman. My favourite of the three is the middle one, the Je Ne Sais Qui. The reason being is that this goes on clear but develops into the prettiest rose flush. It’s really hydrating so feels like a balm but it’s also a lipstick and a stain in one so this is the ONLY lip product you need to use. I absolutely adore it. It’s so pretty and makes your lips look so naturally rosy while being really hydrating and soothing at the same time. Can’t. Get. Enough. Next up are the brushes – amazing! 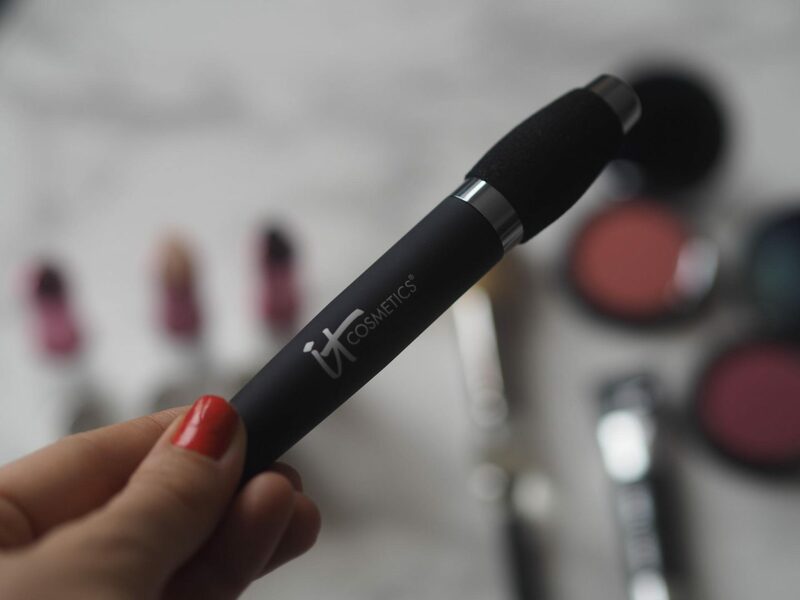 The one below is the IT Cosmetics Heavenly Luxe Powder Brush – it is brilliant. It has a bit fat handle that makes it easy to grip and apply powder. The bristles are super soft and the amount of bristles is perfect for applying powder and getting a full coverage look. Next up is the IT Cosmetics Heavenly Luxe French Boutique Blush Brush. I love the handle on this one as well – it’s easy to grip and make applying blusher perfect. The design of it is gorgeous and it’s great with the Vitality Cheek Flush. Speaking of brushes you will want to try the IT Cosmetics Hello Light Anti-Ageing Radiance Cream Illuminator. This contains hydrolyzed collagen, peptides and drops of ‘light’ technology. This not only highlights and illuminates but this is also skincare disguised as make-up. It’s brilliant. The actual colour of the illuminator gives that perfect amount of dewy glow as well. Not too much shimmer, just enough glow if you know what I mean! IT Cosmetics also makes some damn fine products for the eye area including brows and lashes. I’m currently obsessed with the IT Cosmetics Brow Power Universal Brown Pencil. This has a spoolie on one end to brush through your brow hairs and an angled product tip on the other. The colour really is universal – it works with my brows anyways! Another favourite product is the Hello Lashes 5-in-1 Mascara. This is probably the largest and most technologically advanced mascara I’ve ever seen! I kid you not when I say this takes the place of FIVE products and has been developed with plastic surgeons. It’s actually amazing. The five products it replaces are: 1) Your natural volumizing mascara, 2) Your conditioning, hydrating lash primer, 3) Your lash enhancing serum, 4) Your lash tint and 5) your lash comb/curler! It does actually make your lashes look amazing as well. And last but not least I love the IT Cosmetics Bye Bye Under Eye Waterproof Concealer. This concealer is super-thick and has amazing coverage. You only need a tiny dab and it blends really well too. For this size it will actually last you a really long time as you only need a tiny amount per application. That’s a win! What I like about this is that it doesn’t crease. If you live in the UK, IT Cosmetics is exclusively available at QVC here. If you live in the US, IT Cosmetics is available from Ulta here. Next Post Lookfantastic #LFSummerLovin Unboxing!